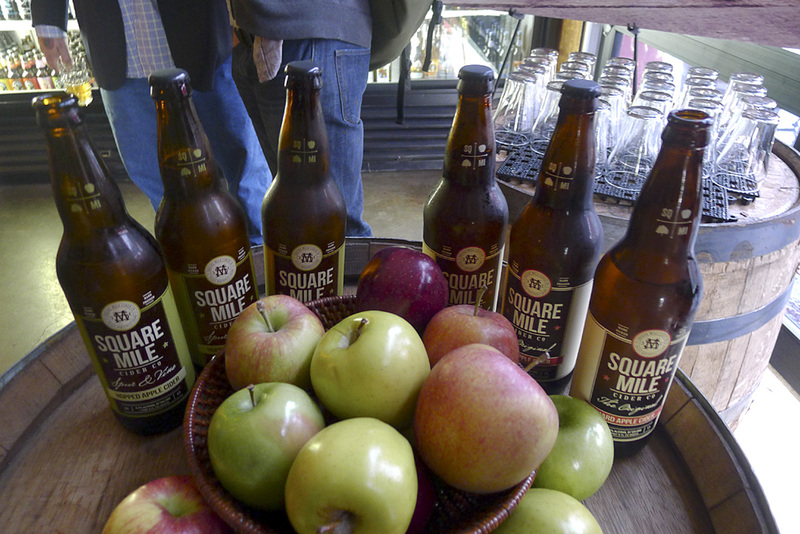 There was a release party for Square Mile Cider Thursday evening at Bushwhacker in Southeast Portland. If you know nothing about Square Mile or Bushwhacker, you'll soon be learning more. 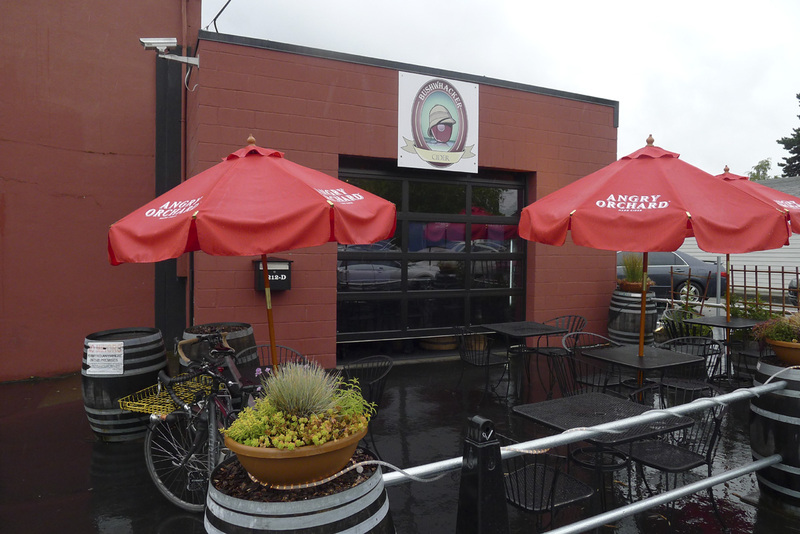 It's all about hard cider, which is in high growth mode in Oregon and across the country. First, Square Mile is a newly launched brand of the Craft Brew Alliance...the folks who represent Widmer, Kona, Redhook and Omission. The official logic behind Square Mile is pretty simple: the CBA wants to spread its umbrella of brands to cover as many palettes as possible. Arguably the more pressing reality is that the cider business is booming. Sales have reportedly tripled since 2007. As a major industry player, the CBA must have a cider. Sam Adams has Angry Orchard. MillerCoors and Anheuser-Busch have both introduced ciders and there are a growing number of independent, craft ciders out there. Expect a lot of craft brewers to figure out how to add a cider to their line. Why cider? That's the quintessential question. Some of the growing popularity of cider is based on a sort of mythology, it seems. Something like 6 percent of Americans are gluten-intolerant, which means they shouldn't be drinking beer, eating donuts or gobbling up pasta, among other things. Yet 29 percent of the American public is reportedly trying to avoid gluten. Some are doing so because they think it will help them lose weight; others think it will make them feel healthier. I'm not here to argue the point one way or the other. Some experts say going gluten-free isn't going to benefit most people who aren't intolerant, though it will definitely cost them more at the grocery store. And avoiding gluten isn't the key to losing weight. That's a calorie issue and gluten-free doesn't solve it. On the other hand, there are those who clearly feel better when they reduce or eliminate gluten in their diet, and not just beer. So there are at least two sides to this argument. At any rate, Square Mile is targeting a growing market segment. The cider isn't made in Portland. It comes from Milton-Freewater, where several varieties of apples are grown and processed on a family farm. The apples are crushed, blended and fermented with lager yeast. Modern storage techniques ensure an ample supply of apples through the year, though production of this stuff is somewhat limited. The two Square Mile brands are The Original and Spur & Vine. Both are clean, refreshing ciders that come in at 6.7% ABV. The only discernible difference is that Spur & Vine is dry-hopped with Galaxy hops during conditioning. Since there's no heat, the hops impart no bitterness. But they do add a mellow aroma and a touch of hop flavor. Beer fans will likely prefer Spur & Vine, although both are quite good. Serve The Original over ice to complement the apple flavor; serve Spur & Vine straight-up to fully appreciate its complexity. The press materials emphasize the history of cider in Oregon. It is certainly true that the original settlers found the soil and climate conducive to fruit production. A lot of cider was produced in frontier Oregon and it remained popular through Prohibition, particularly in rural areas where fruit was abundant. The current growth trend represents a sort of resurgence, as cider had declined in popularity until recently. The Square Mile ciders are currently available on draft and in 22 oz bombers at select locations.That brings up Bushwhacker, billed as America's first urban cider pub. They appear to serve and sell nothing but cider here. 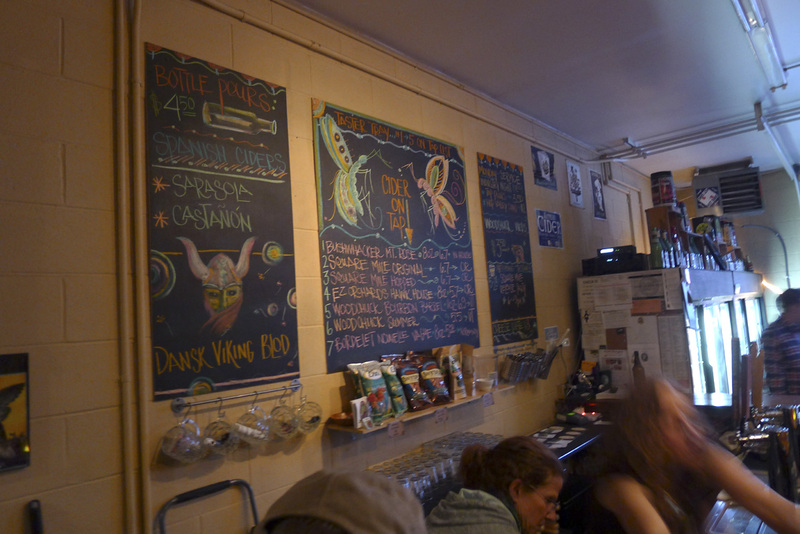 They have six on tap, including their own brand, and a deep supply of bottles. The physical space isn't huge and there's no food. But it's comfortable inside and the patio is surely great in nice weather, which was not in evidence Thursday evening. If you're interested in cider or just want to see the lay of the land, check this place out. Bushwhacker is located in the Brooklyn neighborhood, just off Powell on SE 12th. Mitzi Komisar, once the star of Belmont Station, is involved in running the place and it looks great.